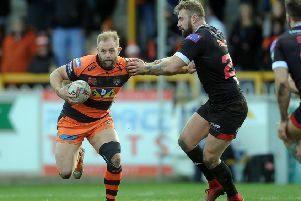 Castleford Tigers have received a boost ahead of tomorrow night’s game against Hull FC with news that 23-year-old prop Nathan Massey has signed a one-year contract extension until the end of the 2015 season. Massey (pictiured) is a product of the Tigers’ youth development system. They signed from Walton Warriors as a 15 year old. He has made over 60 Super League appearances for the Tigers since he made his senior debut in 2007. Tigers coach Daryl Powell said: “I am delighted Nathan has extended his contract. “He is a young player who has come through the system and I really liked the way he took on Jamie Peacock the last time out against Leeds. He fronted up to him and challenged him and I think that is what we need to see more of from the whole team. “Nathan is a tough kid who has got great footwork and he’s also got some ability with the ball. Massey said: “I’m over the moon to sign a 12 month extension to my contract with the club. “I’ve never looked for another club as I’ve never wanted to leave. I’ve got a young family, my partner is happy where I am and she loves the club too so I’m really delighted.